Third year apprentice Ellearn Savvidis has today been awarded an International Scholarship through Skilling Australia Foundation in recognition of her achievements as an apprentice. Ellearn is employed through Group Training Organisation (GTO) WPC Group, and hosted by Mercedes-Benz Melbourne Airport to undertake a Certificate III in Light Vehicle Mechanical Technology. Ellearn’s qualification training is delivered by Kangan Institute of TAFE. The award was presented by the Honorable Gayle Tierney, Minister for Training and Skills at a stand-up announcement ceremony held in the showroom of the Mercedes-Benz Melbourne Airport dealership. The event was formally opened by Frederick Maddern OBE, Chairman Skilling Australia Foundation. 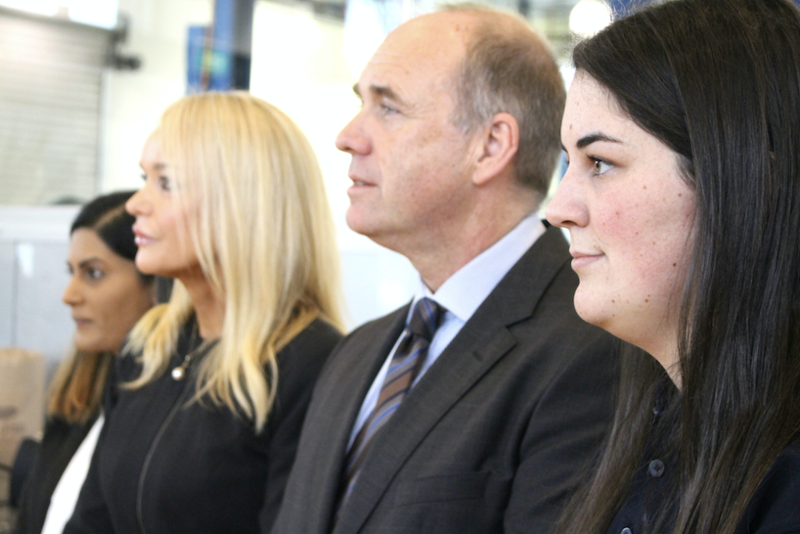 The chair’s speech brought home the importance of industry commitment in the apprenticeship journey. “Without employers and champions like Thomas, Susan and the team at Mercedes-Benz Melbourne Airport, many young people would not have the opportunity to follow their dreams” he said. Andrew Sezonov highlighted that today shows how employers, educators and the community can come together to support and develop the next generation of young Victorians. “There is a public misconception that a career in the trades should be ranked behind academic and university pathways. VET (Vocational Education & Training) plays a crucial role in training the workforce with the skills required to meet future industry and technological demands. Mercedes-Benz are a perfect example of how a VET qualification can lead to a rewarding career” he said. Ellearn will depart Melbourne on the 21st July, where she will embark on a weeklong scholarship including a three day observation at Fletcher Jones Mercedes-Benz, the largest Mercedes-Benz dealership in the United States. The scholarship is made possible with funding from WPC Group and is facilitated by Skilling Australia Foundation. Minister Gayle Tierney congratulated Ellearn on her achievements and spoke about the example she is setting for young people considering a VET pathway. We now work in the age of technological change and the opportunity for a young Victorian to have a look at how Mercedes-Benz America approach skills in the area of automotive, can only benefit their development. Ellearn will bring back an experience she can share with others in her workplace and in Victoria. “From a young age I always knew I wanted to do something in the automotive industry” said Ellearn. Once qualified, Ellearn will join the cohort of just over 600 female mechanics across Australia, far outweighed by close to 70,000 male counterparts. 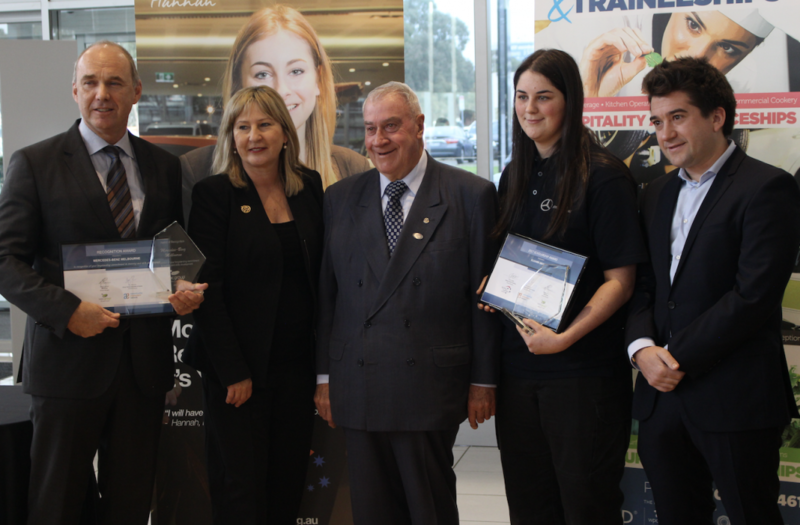 Following the presentation to Ellearn, Executive Director of Apprenticeships Employment Network, Gary Workman joined the Minister to present a recognition award to Mercedes-Benz Melbourne. Together they presented Dealer Principal Thomas Heberling with glassware and a framed certificate recognising the longstanding commitment to training and skills development Mercedes-Benz has demonstrated. Mr Heberling accepted the award and dedicated it to the Women of Mercedes-Benz. “I’d like to dedicate this award, particularly to all the women of Mercedes Benz, we have some very talented women at Mercedes-Benz” said Mr Heberling. Following the formal proceedings, guests were invited to take time to continue the conversation about apprenticeships and traineeships in Victoria, and of course hear about Ellearn’s scholarship travel itinerary. Skilling Australia Foundation believes that all young Australians have the right to have access to the education and skills training they need for the career of their choice. We are passionate advocates for skills-based education such as found through dynamic vocational training courses, technical schools, Technical and Further Education (TAFE) and apprenticeship programs as an initial educational pathway and career starter leading to fulfilling and well paid jobs. We focus in particular on supporting young Australians facing disadvantage and since 2013 have assisted over 1000 young people to successfully start their chosen career in an apprenticeship or traineeship. The Foundation provides job readiness programs, and matches young people with real employment opportunities, providing ongoing dedicated mentors, and educating employers on the need to develop skills. Tuition fee relief grants are available to assist with the up-front apprenticeship and traineeship training fee costs and merit-based scholarships are awarded to fund short study trips to students demonstrating a high level of academic achievement and/or other outstanding abilities, leadership or contributions to the community.